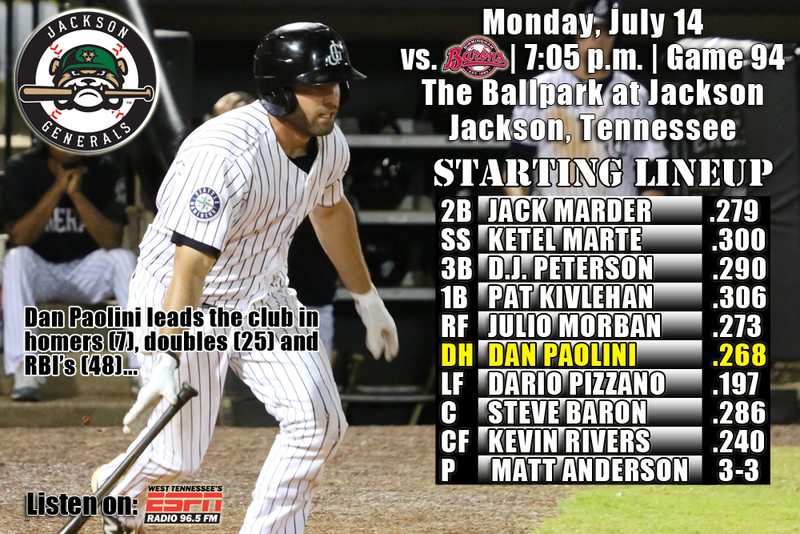 • The Generals conclude a 5-game homestand tonight against the Birmingham Barons in Jackson with game 5 of the series (3-1)…having already clinched the series have won now 2 straight sets and 6 of 8 games overall…also are 6-3 against Birmingham this season and will play the Barons 6 more times in Jackson the final 21 home games of the season. • SS Ketel Marte recorded 3 hits and 1B Dan Paolini hit his 7th home run with the Generals as Jackson defeated Birmingham 8-3 on Sunday. Marte (3×5, R, 2 2B, RBI), LF Dario Pizzano (2×4, R, 3B) and DH Kevin Rivers (2×3, R, 2B, RBI) each recorded at least 2 of the team’s 12 hits, while Paolini (1×3, R, HR, 2 RBI), 2B Brock Hebert (1×3, R, 2B, 2 RBI, BB) and 3B Patrick Kivlehan (1×4, R, RBI) each drove in at least one of the Generals 8 runs. Starter Tyler Pike (5.0,5,2,1,3,3) earned his 2nd AA win, allowing 2 runs (1 ER) on 5 hits in 5.0 innings. LH Cam Hobson (2.0,3,1,1,2,1) allowed a run in the 8th inning, while RH Mayckol Guaipe (2.0,0,0,0,0,2) held the Barons scoreless over 2.0 innings, including stranding the bases loaded in the 8th inning to earn his 6th save. • Hot Hitting July – After batting .294 as a team in June, the Generals are currently batting .283 in July, which ranks 1st in the league. The 12 July home runs ranks 3rd in the league and 7 wins is T-2nd. • Success against Birmingham at home – Since 2008, the Generals are 35-17 (.673) at home against the Barons.